When we think of random acts of kindness, we usually think about how we can brighten a stranger’s day. But little acts of kindness can go a long way in helping us create a stronger marriage too. I create monthly kindness calendars to inspire others to spread joy to those around them. Today, I’m focusing that effort on simple acts of kindness you can perform for your spouse that will improve your relationship. It’s easy to let life get in the way and slowly erode our relationship. We start to take our spouse for granted because he doesn’t demand our time and attention the way other responsibilities do. These simple acts of kindness aren’t difficult to perform and they’ll go a long way to show you appreciate your spouse. A fun way to practice these acts of kindness towards your spouse is to turn it into a challenge. 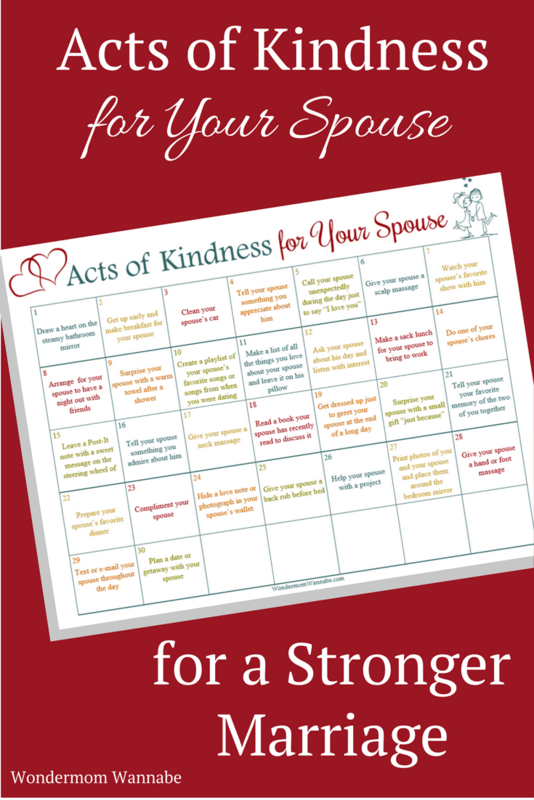 Use this printable kindness calendar as a 30-Day Marriage Challenge. Try to complete all of the tasks over the course of the month. 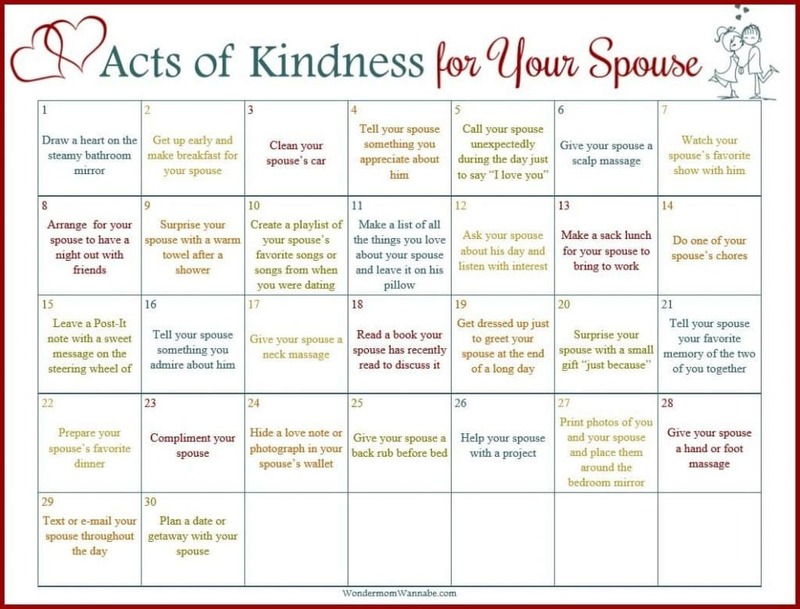 After a month, hopefully showering your spouse with acts of kindness will be a new habit that you won’t even have to think about. Your spouse will feel loved and appreciated and will be going out of his way to make you feel the same! In just a few minutes a day, you’ll have managed to build a stronger marriage. I am sorry to hear this. Before I go on, please understand I am not a licensed professional so this is my opinion and comes from my heart. Sadly, we can only control ourselves. If you have put an earnest effort towards showing your spouse kindness and love and he doesn’t feel respected and cherished, the issue might be internal to him. My husband and I struggled through a period like this and it was helpful to us to seek counseling. We went to marriage counseling and I also saw someone on my own to help me deal with my personal emotions. Talking to an objective third party was helpful to me since it gave me a different perspective. I don’t know if that is an option you are open to, but it was helpful for us. I sincerely hope that your relationship finds itself on a solid, positive path forward. You need to find out what your husband’s love languages are. Look up the five love languages. What a wonderful idea. It’s important to show each other kindness and appreciation each day. Maintaining a healthy and strong marriage takes purposeful work.